Gucci by Gucci perfume is the new modern icon fragrance by Gucci. 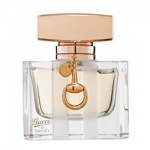 Gucci by Gucci perfume is an unforgettable combination of pear Guava accord and rapsberry, over rich sensual heart of notes of Tiare flower, spider lily and orange blossom and deep, lingering base notes of musk and honey that add a new sensuality and warmth to the strength of patchouli. Gucci By Gucci EDT is a lighter and younger version of the acclaimed Gucci By Gucci EDP.